Today, when you order "BKM Wallet", you'll instantly be emailed a Penguin Magic gift certificate. You can spend it on anything you like at Penguin, just like cash. Just complete your order as normal, and within seconds you'll get an email with your gift certificate. It's like three wallets in one. This premium wallet is built to last a lifetime. "It's great! I'll be using it alot!" "I'm impressed with this prop. It works well and looks great. 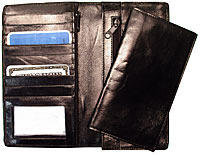 If you're in the market for a card to wallet, wallet, the B*K*M wallet is worth your serious consideration." "This new wallet is cool. The use of the credit card as a guide is ingenious. It's well made, comes with an illustrated booklet of clever routines. You won't be disappointed." **** Addendum to instructions: The BKM wallet does not come with a slide as described in the instructions. Instead, any credit card can be used. I know there are many card to wallets on the market like the O'connels, F1 Nitro, ect. However, if you are looking for a Card to wallet that you can do multiple ways and do it for cheaper then any card to wallet on the market, then this is the wallet you want. The leather quality is not as good as an o'connel, but it's still nicely made and something you'll be proud to show the audience. This function of the wallet is fantastic. I absolutely love it. The device used to make it work is very well concealed and you can easily set it up while the wallet is in your left hand inside jacket pocket. It is a Kaps style loader that is very well made, and makes loading the card a breeze. From loading the card in the wallet, to pulling the wallet out to give to the spectator, takes about 4 seconds. There is no fumbling, and you know instantly that the card is in the wallet because of the wonderful Kaps loader. I can't recommend this method highly enough. The BKM comes with a little mini Mullica wallet. This wallet is made of very nice leather, and because of it's design allows you to load the Card Mullica style, yet be able to let go of the wallet completely and set it on the table without fear of the audience seeing anything. And it allows you to pick the wallet up off the table the same way. It is very convincing. There are 2 cons with this wallet though. The first one is that it doesn't have a zipper. I like the use of a zipper to reveal the card inside, it just adds that extra layer of impossibility. The second con is that when you pull the card out, if you aren't careful, you can expose the secret very easily, and that I don't like. What I ended up doing myself was use my old hip pocket Mullica mini wallet and used it instead of the BKM's version. That mini wallet won't expose the secret when you take the Card out, and it has a zipper to do the reveal which I love. Using that, the BKM is now the perfect card to wallet. I am able to go into a palm card to wallet when ever I want as the reset takes 2-3 seconds, or I can pull out the wallet from the beginning and do the Mullica wallet impossibility at the end with no palming what so ever. Now does this wallet do Card to sealed envelope? No, but honestly who cares? This effect is just as strong to the audience, and you don't have to buy extra Bonsolopes to achieve arguably the same reaction as the Plus Wallet. I own a Plus Wallet as well, and I do love it, but I find myself going back to the BKM when I'm doing restaurant work or any close up sets. Plus the price for the BKM is a flat out bargain, and is half the price of a Plus Wallet. I know the Plus Wallet gives you more then the BKM, thus the higher price, but if all you want to do is a card to wallet, then this is a no-brainer decision. I highly recommend this product to anyone that wants to do a Card to wallet only, because this wallet will do just that and do it well. fits in the jacket pocket. is highly usable! not your average wallet, but that doesn't matter due to the effects. highly versatile as well. Even if it is a big one to wear in a pocket, I never walk away without it ! Complet, nice, easy to use, you can show both side,... the leather quality is ok and it is very usefull for an usaual use. I ordered mine 5 years ago and I still have it in good condition. But I had only 1 issue ..... It's a little bigger than I expected ..
Other wise .... A great tool.. This wallet set is very well made, and for that reason I give it 5 stars. However, this has some of the worst instruction’s I have seen since the 1970’s. There are pages upside down and out of order. This information could be reformatted on a computer with one 10 minute investment of time. This would give the buyer an easy to read set of instructions.